This entry was posted in auto claims auto claims and tagged car care car care tips car leather repairs car maitenance car repair car scratch repair dent removal Dent repair on March 18, 2010 by admin. No matter what kind of car you drive, when you go in for repairs, you want the job done right. That’s why Sameday has always used insurance approved systems and continues to offer a full guarantee on their refinish work for as long as you own the vehicle. 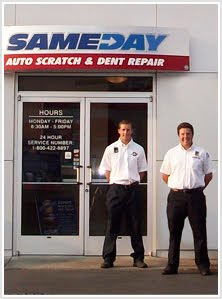 Sameday has a well-organized facility in Olympia’s Capitol Auto Mall. Our services are also available through the service drive programs at many of the northwest’s premier auto dealerships. We also provide on-site mobile service for your convenience (we can come to your home or work location).